By Eric Thomas: Former welterweight world champion Kell Brook (36-2, 25 KOs) says he’s going to try and return to the 147-lb. division if his body well let him. Brook, 31, would like to fight Amir Khan if he’s finally ready to make the fight. Brook fancies his chances of knocking out Khan, who hasn’t fought since he was knocked out by Saul Canelo Alvarez over a year ago on HBO pay-per-view. Brook is coming off 11th round knockout loss to Errol Spence Jr. on May 27. Brook suffered a broken left eye socket in the fight. This was the second fight in a row that Brook had suffered a fractured eye socket. In Brook’s 5th round knockout loss to middleweight champion Gennady “GGG” Golovkin on September 10 last year, Brook’s right eye socket was fractured. He subsequently had surgery to repair the problem. 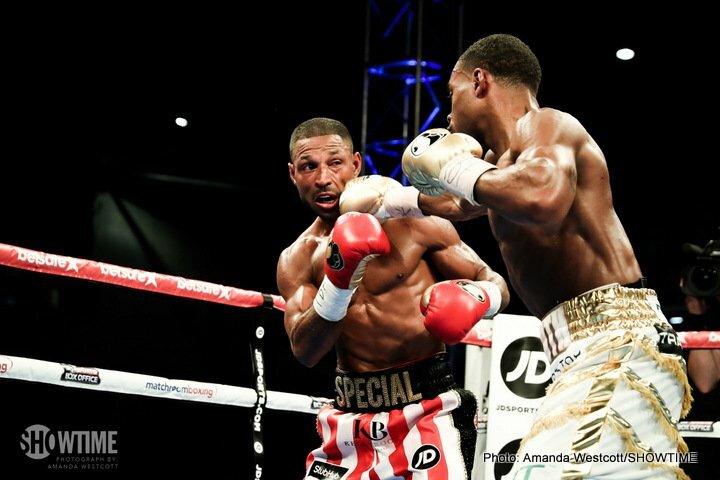 Now that Brook has suffered an identical injury to his left eye from the Spence fight, there are question marks about whether his eyes can hold up to the rigors of a normal fight. Staying at 147 would seem to be the smarter move for Brook if he wants to decrease the chances of him suffering additional eye problems in the future. Despite his promoter Eddie Hearn wanting him to move up in weight to junior middleweight, Brook isn’t too excited about making the jump to 154. Brook feels that there are no big fights in that weight class, and the fighters are too big. Unless there’s a catch-weight involved, Brook doesn’t see it as a clever idea for him to be fighting at 154. “I have to see if my body can make it,” said Brook at the AppsEmpire event about him wanting to try and return to the welterweight division. “If I can make it good, welterweight is where the big fights are. There’s really nothing at light middleweight. They’re too big unless we start making catch-weights,” said Brook. Brook should be able to make 147. He’s no bigger than Errol Spence Jr. in between fights. If Spence can do the challenging work to get down to 147 to make weight, Brook should be able to do the same. Moving up to 154 would be crazy for Brook. The top guys in the junior middleweight division are huge at 6’1” like Jermell Chrarlo and Jarrett Hurd. Erickson Lubin is 5’11” and Demetrius Andrade is 6’1”. While Erislandy Lara is only 5’9”, he rehydrates to the low 170s. For all intents and purposes, the top 154 lb. fighters are middleweights with the same size if not bigger than middleweight champion Gennady “GGG” Golovkin. Hearn doesn’t seem to realize how much size the 5’9” Brook would be giving away if he moves up in weight to 154. Brook would be fighting guys bigger than Golovkin each time he fought the better guys in the weight class. Even some of the regular contenders like Liam Smith and Liam Williams are big guys with middleweight size. Brook is in the right weight class for his frame by fighting at welterweight. Brook wants a fight against Khan. If that fight is going to happen, it’ll take place in 2018. Khan is hard to read right now. He seems to still fancy his chances to win a world title at 147. If Khan doesn’t want to make the fight with Brook yet, he will likely change his mind soon once he gets beaten again. Khan needs to get back in the ring right now, as he’s been out of action for almost 2 years. Khan needs a tune-up to get the rust out before he decides with who he wants to fight. Brook would be Khan’s best bet for a big payday. Khan won’t get big money as a challenger to champions Keith Thurman and Errol Spence. Khan can forget about getting Top Rank to allow him to fight Manny Pacquiao or Jeff Horn. Those fights aren’t going to happen. The promoter for Top Rank is saving Horn for either Pacquiao or Terence Crawford. Pacquiao is being saved for Crawford or Horn. “I could be fighting at the end of the year, but it’s going to be a real push to get me in fighting condition,”said Brook. “I’m looking at early next year to get back out again. I’m looking for a big fight. When I lost my IBF belt, it really kicked in. To be honest with you, I’ve not been in the gym much. I’ve been feeling sorry for myself. I want to get to beating that queen Khan. We want to make that fight happen. We all want to see it. I want to smash him. Khan, I’m ready to fight you. This year coming up, I’m ready for you. I’m giving some of those chocolate brownies,” said Brook. It’s not likely that Khan will take the fight with Brook just yet. Khan will almost surely agree to face Brook at some point, but only when his career looks like it’s on its last legs. Khan is probably 1 or 2 losses away from his career being finished. It would be smarter for Khan to take the fight with Brook right now if he wants to get as much money as possible, but he’s likely going to wait. Brook is being saved for when things are looking completely bleak for Khan with his boxing career all but over. The sad thing about Khan waiting is he won’t get as much money for the Brook fight, because the boxing fans won’t want to pay to see Brook fight an over-the-hill fighter. If Brook loses another fight or 2, his career will be effectively over as well as a major player. That’s why it’s crucial for Brook and Khan to fight each other right now. If Brook can continue to make weight for the welterweight division, he needs to target WBA/WBC welterweight champion Keith “One Time” Thurman, who has had back to back grueling fights recently against Danny Garcia and Shawn Porter. Thurman is getting heavy in between fights, and it’s only a matter of time before he loses. If Brook can get a chance at Thurman in the next year, he could beat him possibly. Besides Brook’s eye problems, his stamina needs to improve. He looked tired against Spence and Golovkin in his last 2 fights. Brook fought well in both fights, but by the 5th round, he was looking exhausted from the constant movement he was doing to avoid the intense pressure that was being put on him.